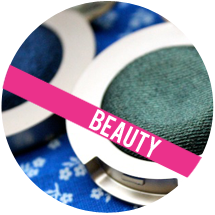 Do you ever wonder why some cosmetic colors are considered "normal" while others are still strictly in the "offbeat" category? Like, who decided bright red lips were completely acceptable, but forest green ones were not? I know common lipstick colors generally imitate natural lip shades, but we overlook this rule for a lot of other cosmetics. For a majority of the past century, it was basically impossible to even purchase certain colors of lipstick, nail polish, or eyeshadow. Luckily, you can find almost any shade of makeup you want today, although the most popular and widely sold lip colors remain within the typical rainbow of reds and pinks. Don't get me wrong - reds and pinks are awesome; that's what I wear nearly every day. 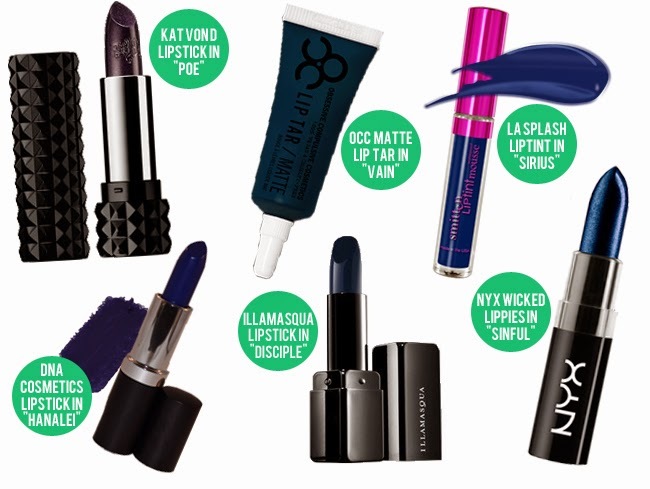 But when I saw a photo of a dark navy blue lipstick recently, I got a little obsessed. It stuck in my brain until I found myself casually googling, and eventually obsessively googling, and pinteresting and instagraming and bookmarking...you know, the typical slippery slope. The ideas commonly associated with colors tend to hold true in lipsticks: red is bold and fiery, pink is sweet and girly, skin tones are clean and simple. When I think navy blue I think preppy, classic, neutral (I mean, it represents like 90% of school uniforms), but when I see navy blue lipstick, none of those associations apply. I think that's because of the set "rules" about makeup colors and what's considered "normal" or "weird," but someone somewhere just made those ideas up. Shades like cranberry or eggplant are in the same neighborhood as navy, but those are made by companies like Revlon and sold in every drugstore, whereas very few mainstream cosmetic companies make any kind of blue lipstick at all. 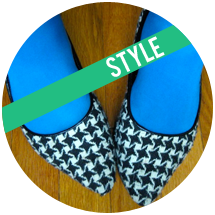 To me, a deep navy shade can look vivid and unusual while still looking chic. I'd love to see velvety deep navy lips become a vampy standard, and I'm going to do my part to see that it does. Would you wear navy lipstick? Do you often wear any other "weird" lipstick shades? What's the craziest makeup look you've ever tried? I love off beat lipsticks. Red and pinks are popular because it can enhance one's natural lip colour. Blue lips is usually associated with lack of oxygen which is why it's not very popular. But I like mixing it up once in awhile. Great picks! 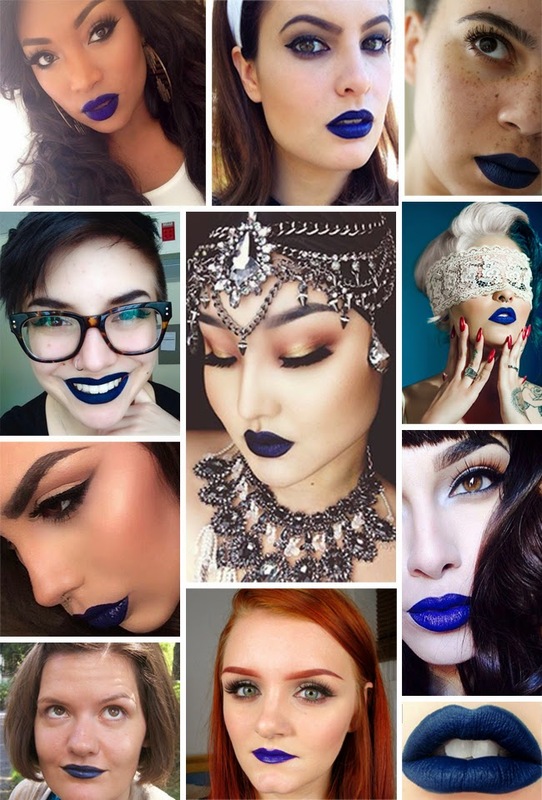 Very strange, I was just looking up navy blue lipstick today...! I own a dark blue lipstick by Wet n Wild, it was a special Halloween colour, I believe. Love it. I wear metallic silver and gold a lot, but those are the "strangest" colours I own. Pinks and some corals I can understand, reds pushing it a bit, but purples and browns (unless you actually have darker skin)? Oranges? Always seemed strange to me that those can be considered normal shades. Granted, I love them all. =D I can't pull off white lipstick very well, and I don't like how black looks on me, but I think they're neat shades, too. ooh such a good lipstick shade! i'm obsessed with navy clothes right now! YESSSS totally in love with this trend, too. Obviously I'm all in for crazy lip colors (seen by Coven). I thought I'd mention that I'm going to order some NYX lipsticks because their lavender shade is almost identical to Coven... In case you're interested!! Sinful looks beautiful too so I'll probably throw that into the order, too!! I love this look. Then again I would I love purple lippy too! I think these looks are really stunning. I'm noticing though that all of the ladies in the photos have brown or green eyes... I tried a navy lipstick a couple years ago and felt like I had a hard time pulling it off. Maybe blue eyes + blue lips is a little much. Ooh this is such a different but cool trend - it's amazing how good it looks on people considering it's not the every day shade. I really enjoyed reading this post so thank you.